Have you been battling acne for ages and are growing hopeless with drugstore solutions? You are not alone. Nearly 100 million Americans share the burden of battling acne on a daily basis. You would think that a quick and easy solution to the problem would have been discovered by now, especially among the more than 1000 different treatments available in stores. Unfortunately, many of them are merely short-term solutions, take a long time to begin working or will cure your pimples but will not relieve you of your irritated skin. Sandalwood has long been known for its skin-friendly cleansing properties. If you have ugly scars, blemishes, spots or eczema on your skin, this oil can help you get rid of those quickly and prevents recurrence. Are you finally up for trying some alternative, natural treatments for your complexion? Look no further. Sandalwood essential oil is the ideal remedy for all kinds of beauty complaints – both regarding skin, as well as hair. Indeed, the substance has been used for centuries as a form of Ayurvedic medicine due to its rich, therapeutic scent. Sandalwood oil has a number of healing properties and is potent against fighting bacteria, inflammation, cuts and wounds, muscle spasms, dry and aging skin, etc. It quickly becomes evident that sandalwood provides one of the most varied and universal remedies for skin problems. Additionally, it can help you deal with short, dry hair as well. Sandalwood trees are some of the most valuable plants in the world and can grow for nearly a hundred years in tropical regions. Unfortunately, the sandalwood tree has been an endangered species, which is mainly due to its excessive, unsustainable artificial harvesting. Luckily, TFS, a leading provider of sandalwood has recently created a 60 squared-kilometers sandalwood tree forest. This is great news, as a dermatology company named Galderma has been working with TFS to produce licensed sandalwood oil-based remedies for skin inflammation. How Is Sandalwood Oil Made And What Is It Used For? This essential oil is derived from sandalwood trees that are mature. It is extracted via the distillation of steam. 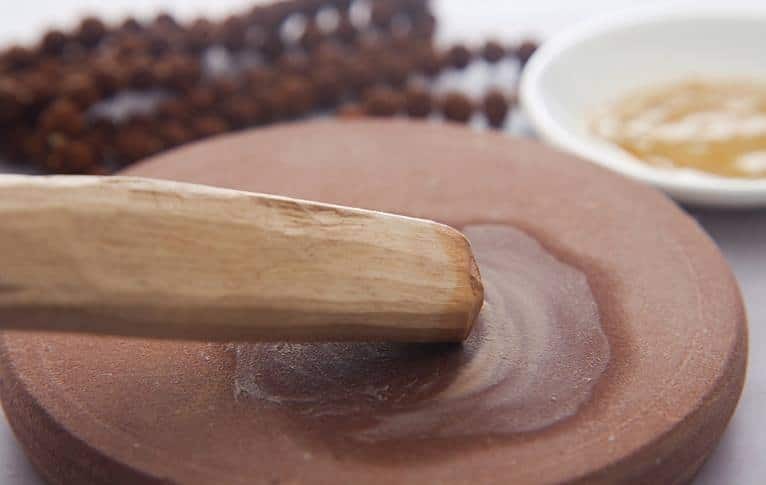 The natural product is used for a myriad of purposes, starting from invoking relaxation and concentration during spiritual rituals to healing various ailments in Asian medicine. Indeed, it is even employed as a religious tool during funeral services in South Asia. Nevertheless, it can be used for more practical purposes, too as its beauty benefits, in particular, are seemingly endless. Sandalwood oil can combat all kinds of skin issues, such as acne or scarring. Indeed, sandalwood oil can both prevent breakouts, as well as fully do away with any remaining zits. It provides healing against skin inflammation, and reduces irritation and redness. This is because the sandalwood acts as a weapon against bacteria and infection. The oil thus both thoroughly cleanses areas with existing acne, while disinfecting any old wounds, too. It can also generally even out your complexion, allowing it to be smooth and fresh. We told you it was good news that sandalwood tree harvesters have teamed up with a dermatology company! You can go get yourself the Galderma product called Cetaphil, as well as other products from the company, which are a part of the three-stage skin treatment dubbed the Benzac Acne Solutions. The company claims that one of the main benefits of the Benzac solutions is that the therapy results in predictable skin. Why are Galderma products different from the usual acne-combating choices? Basically, the company aims to not only rid its clients of zits, but to also prevent their re-appearance – both in the short- and in the long term. While we may only notice them once they surface, pimples actually form and re-form under the skin for weeks. The company’s products thus intend to keep acne in check for a longer, sustainable time period. Essentially, Galderma seeks to permanently solve skin issues, rather than only treat their symptoms. Because of this, their products must be used over a longer period of time, rather than only in instances when acne becomes visible. Indeed, customers with a variety of skin types claim that they experience stellar results from this treatment in only a few weeks. This is all due to the products’ completely natural components, which target inflammation and bacteria. Galderma’s goods contain sandalwood oil, as well as lemon myrtle, honeysuckle, zinc, onion solution, Kakadu plum and, of course, the usual salicylic acid. They are especially designed to be gentle on the skin and keep your pores clean. The best part is that the company attests that all of the components it uses are vegan and cruelty free. Moreover, their sandalwood oil supplier, TFS, employs renewable energy to extract the essential substance from the plants. Last but not least, the forest harvested by TFS has not only given us ample supplies of sandalwood oil, but it has provided various species of flora and fauna with a new home. So, you do not have to worry about any environmentally detrimental effects while ridding yourself of acne with Galderma. How Can You Use And Apply Sandalwood Oil At Home? Alternatively, you can opt for using sandalwood essential oil at home. Drip some of the substance on a Q-tip and gently rub it onto the affected area. If you are worried that your delicate skin may react adversely to such a powerful cleanser, don’t hesitate to combine it with particularly soothing substances, like coconut, jojoba or olive oil. Do remember that this essential oil should never be applied directly to your skin. Rather, always aim for mixing it with any sort of cold-pressed extra virgin oil from lavender, rose, geranium, etc. For cleansing acne, just mix a tablespoon of your oil of choice with a drop of sandalwood oil and soothe your irritated skin with the resulting mixture. This can be used both on facial or bodily skin, as well as on your scalp. The sandalwood oil’s antimicrobial characteristics can concretely target severe skin infections, as well. If you suffer from psoriasis, eczema or rosacea, mix a teaspoon of the oil into a glass of cold-pressed coconut oil. The mixture will calm your skin problems and reduce any sepsis that may have formed. Sandalwood is also specifically useful in fighting old acne traces and dark spots. You can help yourself by adding a few drops of its oil to a bowl of hot water. Just linger on top of the bowl and let the steam perform its magic onto your face. For best results, cover your head with a clean towel, so as to keep the steam locked in. This approach can even contribute to a healthier respiratory system, so don’t hesitate and try it out! Even if you do not have specific, severe skin conditions that you need to combat, you can still use sandalwood essential oil as a beauty product for your skin. For instance, this product is able to even out any discoloration of your complexion that you may experience, such as one caused by tanning. While the oil won’t add to your tan, it can help reduce it by lightening the darkened skin – this way your entire body will once again obtain its even color all over. How to go about lightening your tanned skin? Apply a mixture of a tablespoon of coconut oil and 5 driblets of oil to the needy area, and watch the dark skin lighten up until your entire surface becomes evenly tinted. Last but not the least, you can use sandalwood essential oil in the case that your skin is excessively oily. The mixture you need for this is made of several drops of the oil, mixed with a teaspoon of oat flour-and-water paste. Apply this concoction on the oily area and you should end up with a dry mask after about a quarter of an hour. The mask serves to tighten pores and to thus keep the production of sebum in check. Rinse with water and enjoy a refreshed complexion. On the other hand, if you suffer from dry and cracked skin, this essential oil can help hydrate it to its core. The emollient characteristics of the oil serve to lock moisture into the skin, thus, aiding you on your way to a moisturized, glowing complexion. A single drop of the oil, mixed with some rosehip oil will do the trick. Half a teaspoon of rosehip essence should be more than enough. Rubbing this concoction into your face before hitting the sheets will leave you with a healthy-looking face, without a trace of shedding flakes. In addition to all of its skin-healing properties, this oil is also great for hair, hydrating it when necessary, and stimulating its growth. Half a dozen drops of the essential oil should be enough to keep your hair smooth and hydrated. If you want to get rid of your dull, frizzy hair, just apply this to your ends after washing, and enjoy your renewed mane. What is more, sandalwood oil can help you grow your hair out, too. If you are trying to get longer hair, you are probably already lathering all kinds of oils into it on a regular basis. For best results, mix a couple drops of sandalwood oil into a teaspoon of extra virgin sweet almond oil. Apply this onto your scalp and let it rid you of any irritation and flaking, while stimulating hair growth. It will also make your locks fragrant with woody, relaxing aromas, which is a win-win situation in our book! Specifically because of its particularly pleasant fragrance, this product can even be used as a perfume or deodorant with a therapeutic, natural smell. If you are tired of purchasing commercially-available deodorants with chemical formulas, opt for this magically-scented, organic aroma. Not only will your skin smell gorgeous for hours on end, but it will also remain protected from the germs which cause unpleasant smells. Mix several drops of sandalwood oil and 30ml of coconut oil into a glass bottle. A pea-sized quantity of the mixture should be sufficient to keep sweat away, while keeping your armpits freshly perfumed. Now that you are ready to try the excellent benefits of sandalwood essential oil, take a jog to your closest health and beauty store and ask for a vile. Alternatively, look for Galderma therapy products in stores and on-line. Be aware that as essential oils go, sandalwood oil is on the more expensive side. Particularly, if you decide to opt for top-quality oil with Indian origins, you should be prepared to spend a few extra bucks in the name of healthy hair and skin. If you are not in the mood for splurging, you may also want to opt for sandalwood oil originating from Austraila. Still, using a fully pure and high quality sandalwood essential oil will really make a difference in your beauty routine, so don’t worry about having to replace it with another remedy in a couple of weeks. Some stores sell diluted versions of this product, which only serve to weaken its remarkable effects. Honey For Acne – Effective Ways To Use Honey and Does It Help?